hello, my name is sierra lei, and i am here today to teach you how to gift wrap. how to make a bow will be later. =) that seems to be the one everyone wants to know more. i don’t quite remember how talented of a gift wrapper i was earlier than 5 years ago. i must have been decent because a few people would have me wrap gifts for them. but then again, i might not have been decent-they might have just REALLY not wanted to wrap their own gifts. who knows. but i did enjoy wrapping. when i got hired onto papyrus, i was told we were going to be doing “a lot of gift wrapping and a lot of custom printing.” awesome and awesome. 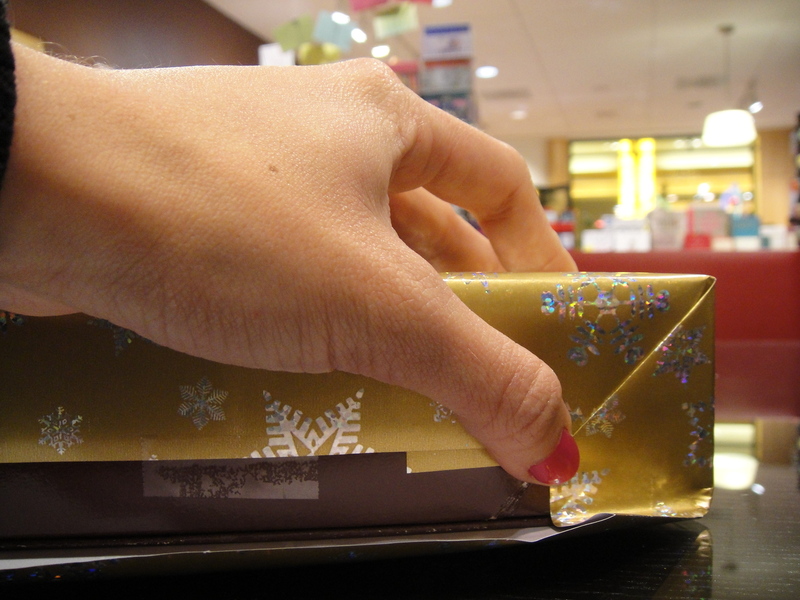 and then i got trained to gift wrap and………………….they used double sided tape? double sided tape is your best friend. for every roll of regular tape we use, we probably use 4-5 rolls of double sided tape. it’s my #1 supply at work in between the months of october to january. when october rolls around, must start stocking up on double sided tape. must order two times more double sided tape. must never run out of double sided tape during the holidays. never. it will ruin my holidays at work. five and a half years ago, while i was being trained at our northpark location, a customer walked in with about 5 gifts (what is up with the common number here?) on a busy day. “i’d like to have these wrapped.” all i remember was that they all came in tumi boxes. nice. last year i wrapped about 250-300 gifts in between thanksgiving and christmas at work. just at work. that’s not including wrapping OUT of work. i have 2 big clients that i wrap for-they are both sweet ladies. i have been wrapping for one of them for over 4 years now. there are 14 people in her family (from her parents/in-laws to her grand children) and i wrap for all their birthdays, graduations, and other holidays (easter, valentines, etc.) throughout the year. i feel as if i know every member of her family just through wrapping their gifts! every single gift for this client is detailed to the tissue paper in the box matching the wrapping paper which matches the ribbon, which is always a double bow, not a fluffy bow. if she brings a neiman marcus gift box in with neiman marcus tissue paper and a silver neiman marcus sticker on it, that tissue gets thrown in the trash and replaced with a new pack of tissue to match whatever roll wrap she chooses. little details matter to certain people. oh, and she never wraps more than 3 gifts with the same roll of wrapping paper. heavens, no. my second client, on the other hand, doesn’t mind how many gifts are wrapped in the same paper. but she wants her gifts to look like money. they have to look grand. 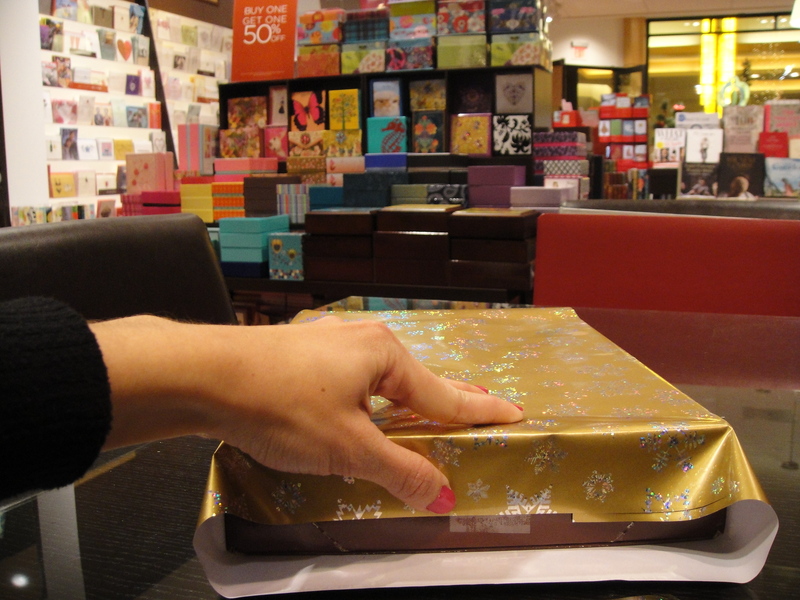 that “little” $500 gift card needs to be put in a pen box with a BIG, FLUFFY BOW. her choice of wrapping paper leans more towards our sheets of handmade paper. 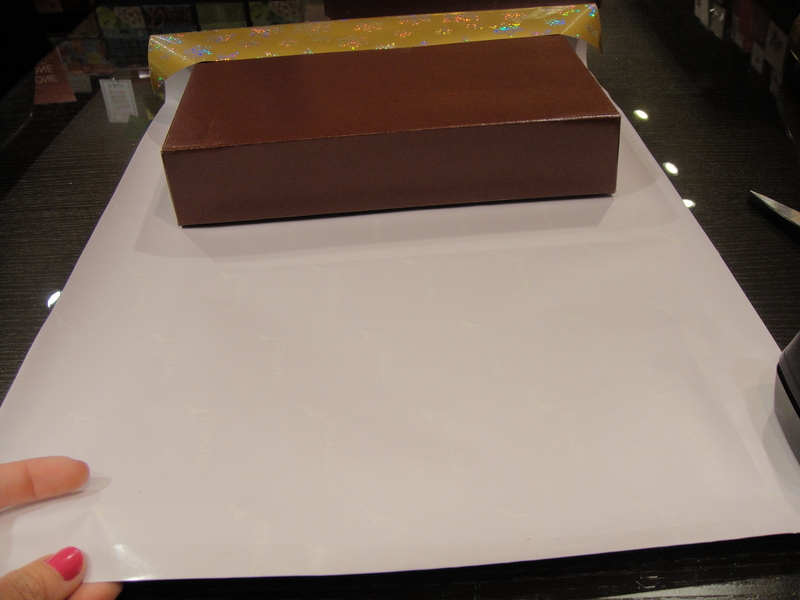 they used to be priced anywhere from $3.95 a sheet (which is about 20 inches by 30 inches-enough to just wrap one gift, really) to $12.95 a sheet. whereas my first client would buy out our entire district’s stock of holiday spooled ribbon (i’m not kidding, she’ll buy out all 4 stores), this client would buy out all the sheets of wrapping paper. these ladies mean business, y’all. and when they want their gifts wrap, they want it done right. and if you don’t do it right, they’ll make you redo it. 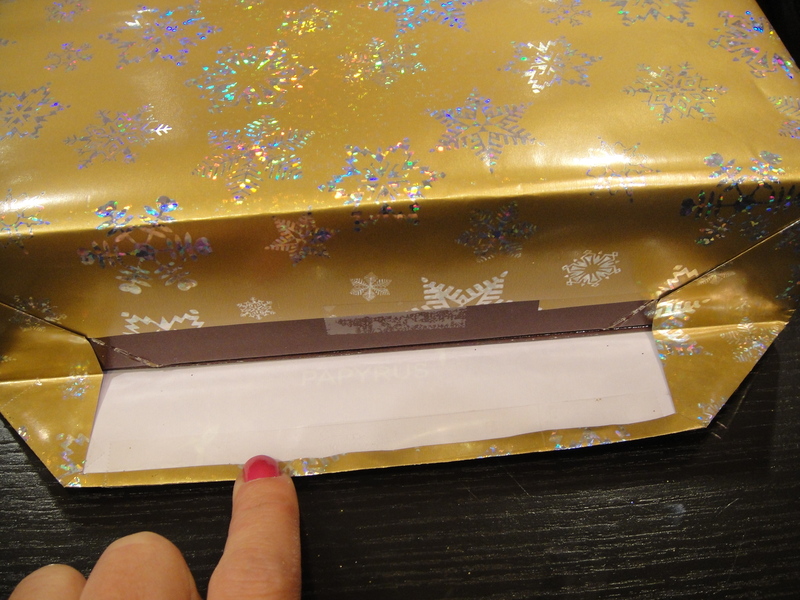 and…if you don’t do it right that second time…..they’ll make you wrap it again. =) it has happened! (not to me, haha) i will refer to my clients as MRS. D (client 1 who i have wrapped for in the past 4 years) and MRS. T (client 2 that i have wrapped for in the past 2-3 years) because i already know that i will be blogging about them this holiday season. they always make it on my facebook, so they will eventually make it on my blog. =) they are just very giving ladies. i wonder if mrs. d’s son is still single…….hmm…..
gift wrapping isn’t everyone’s cup o’ tea. it might not even be a big deal to others as far as doing the task, whether they like doing it or not. and to some, it is what makes the entire gift, regardless of what is in it. and there is a price tag that comes with all of the above. having a bottle of perfume wrapped could range from $10 to $30, depending on what you would like to have your gift wrapped with. 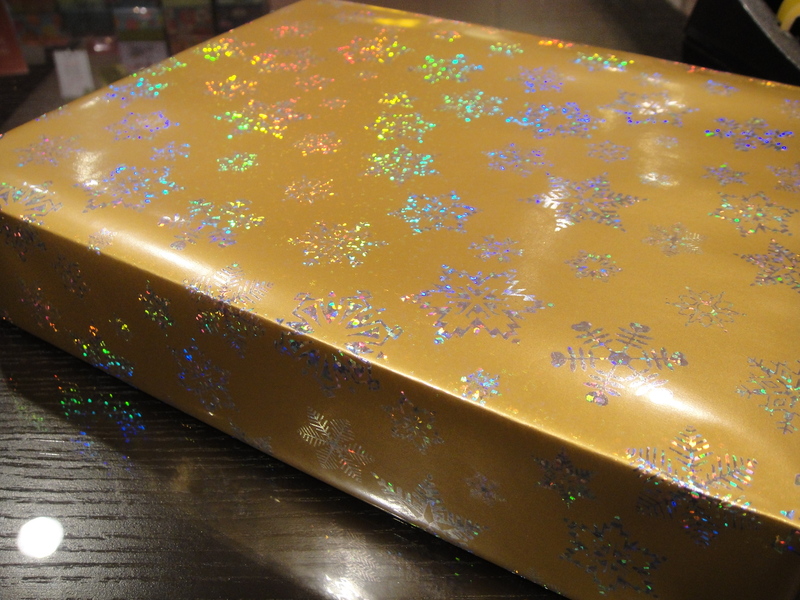 there’s lots of different ways to have your gift wrapped: just with the wrapping paper and nothing else, with tissue and in a gift box, with a few yards of ribbon, with a shoestring tie bow, with a fluffy bow, with more that one style of ribbon, with a topper, or with an enclosure card. some people don’t care. some people really care. it completely varies. 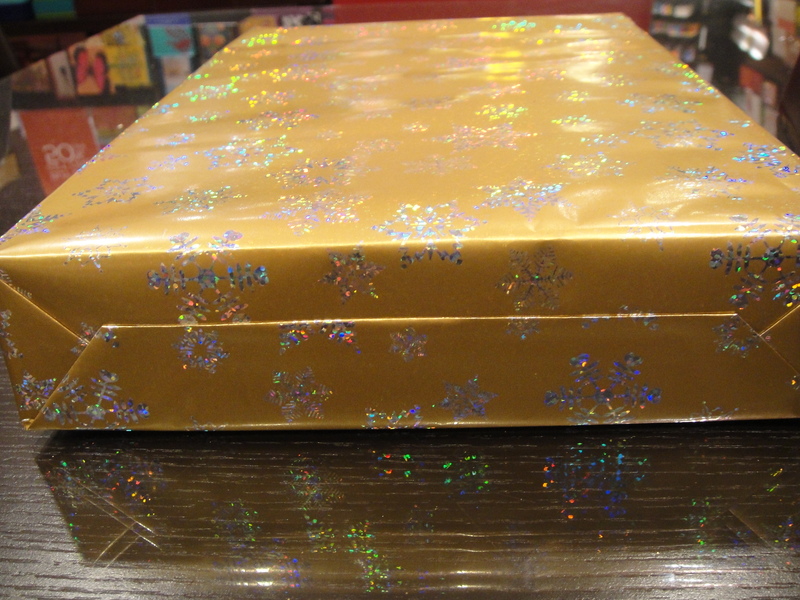 but we do have promotions in which we can gift wrap for 99 cents, so you get to save some money every now and then. i know i have taken y’all on a long journey through the history of sierra’s gift wrapping experiences when all you wanted to read (and see) was how to gift wrap. 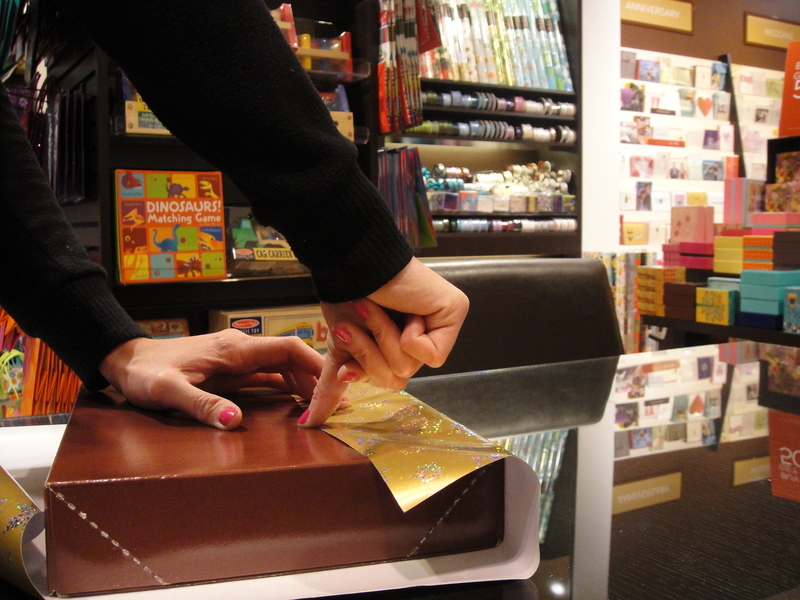 DO YOU WANT TO LEARN HOW I GIFT WRAP? 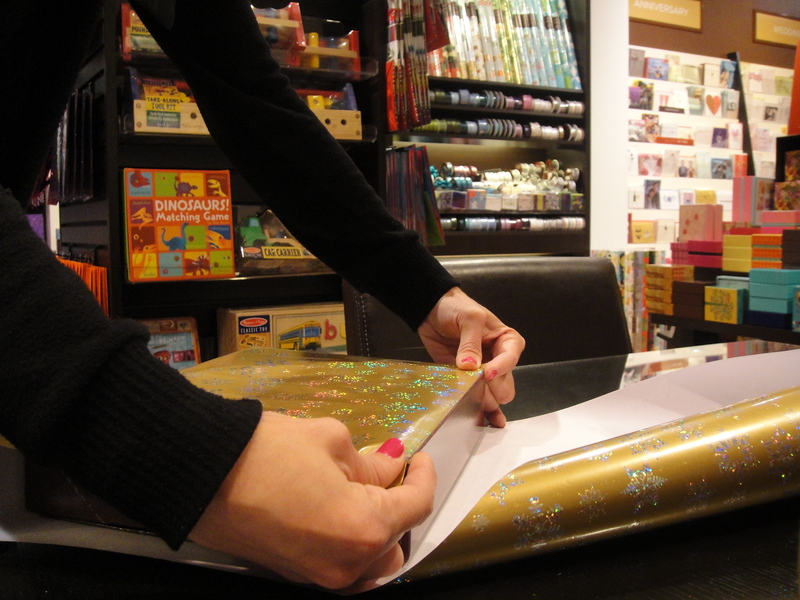 take note that we are wrapping the gift upside down, so that flap will end up facing downwards in the final product. 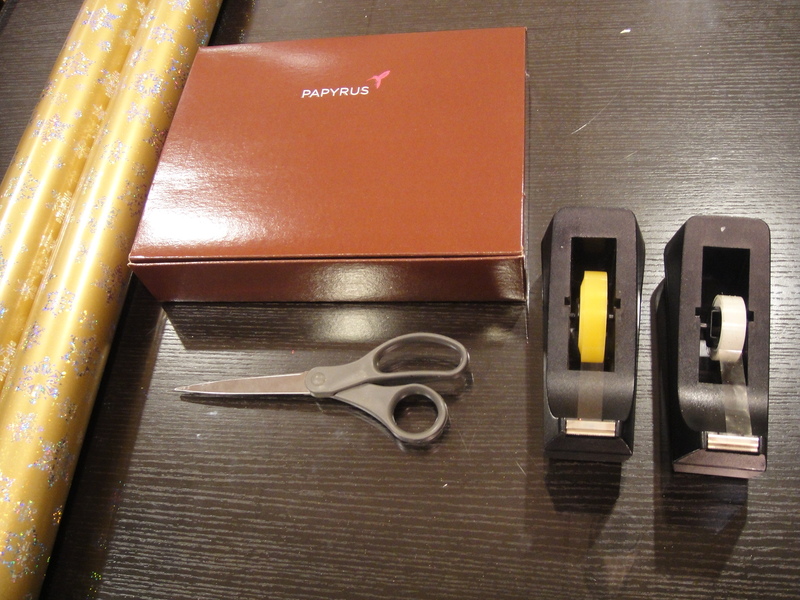 repeat the last few steps on the other side of the box and you are done wrapping. and there you have it. 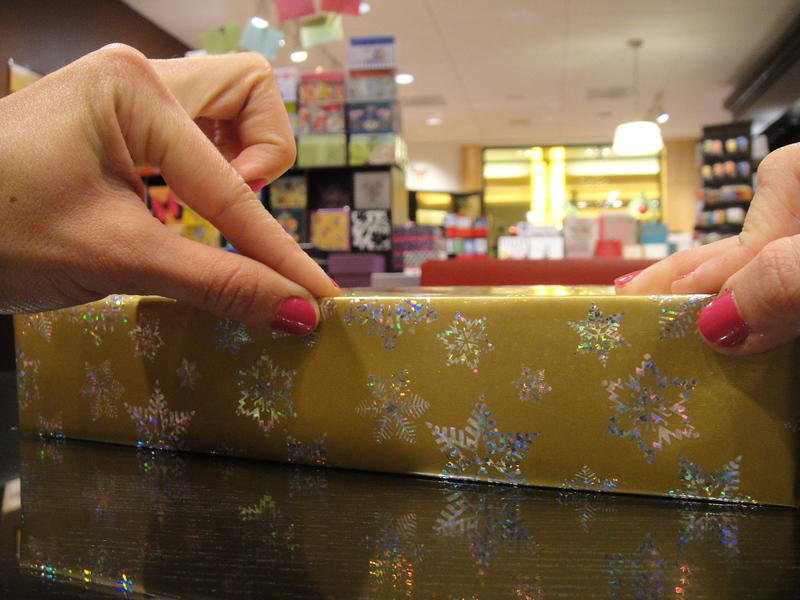 your “no tape showing” gift wrap tutorial. that was actually a gift i wrapped for a display at work, so i had no choice but to use that or a silver wrap, and the silver one would have been more difficult to see. in the next few days, i will post some pictures of my store display because one of the rolls i used is SOOOOOOO GORGEOUS, we’re all going nutty over it this season. more pictures, tutorials, and blogs to come from the past week. i must hurry, as this weekend is going to be FILLED with fun and over 300 more pictures! 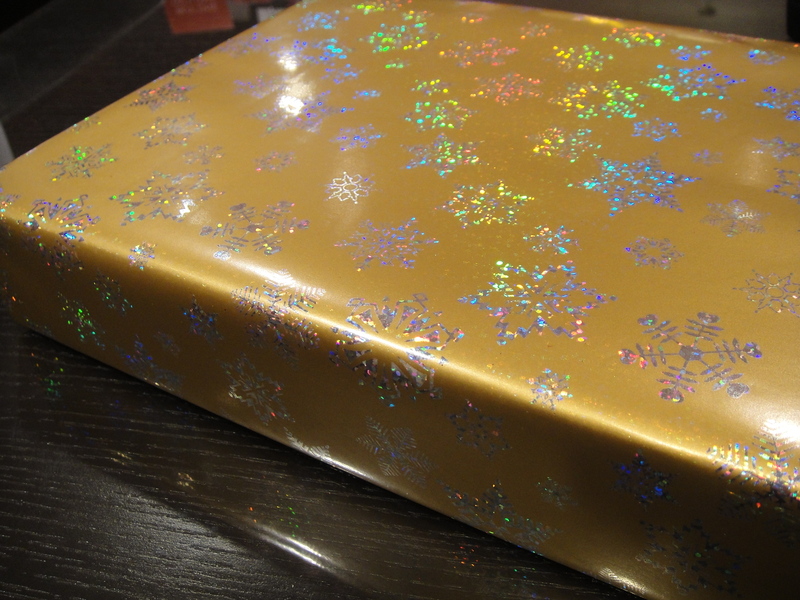 This entry was posted in crafts, gift wrapping, holidays, how to, papyrus, Uncategorized and tagged gift wrapping, how to gift wrap, photos, work. Bookmark the permalink. I can’t believe how many gifts you’ve wrapped – that’s insane! 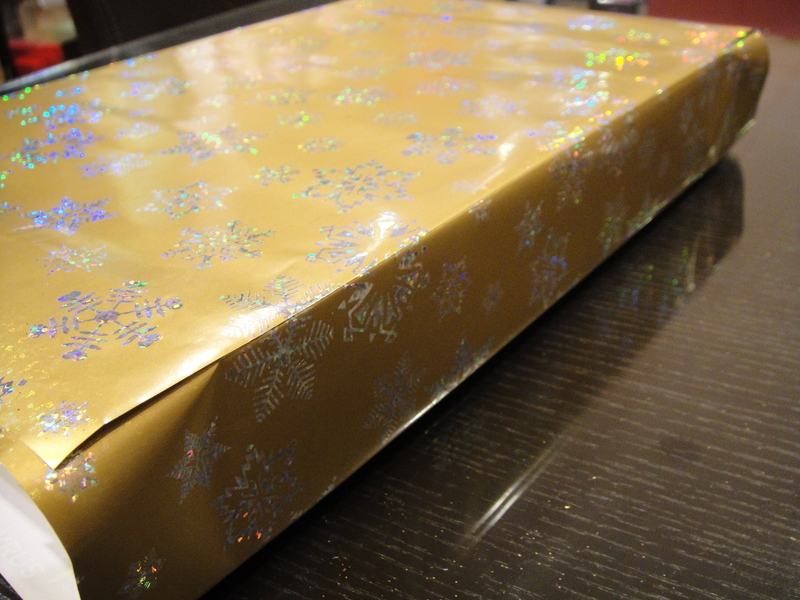 I write a blog about gift wrapping but have never wrapped that volume before. Thanks for sharing your tips and stories. So interesting! oh, yes! you’re welcome! and today i wrapped 12 boxes in under 45 minutes, which was insane, but they were without bows. haha! i love your blog, by the way! Okay this was AMAZING. Thank you so much for sharing. 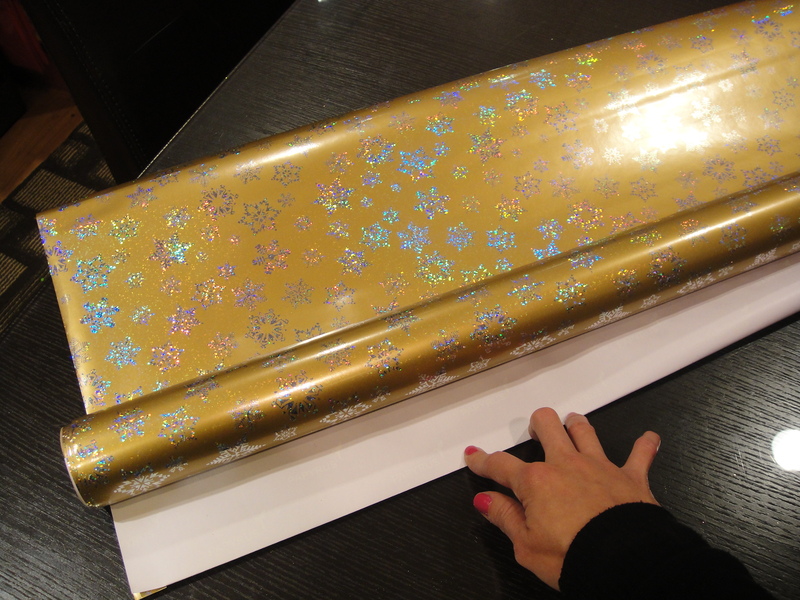 I am going to be following this tutorial for gift wrapping this year. You are so lucky you work at Papyrus! I love Papyrus! So double sided tape is the key eh? Huh! Go figure!! BEAUTIFUL WRAPPING!! !